People refer to 3D printing as ‘mass customization’. You have the combination of an automated production capability in the 3D printer without the high up front tooling costs that typically result in mass production of a generic product. You can take a base design, modify it so that it suits your needs exactly and then print it out without a ton of manual labor. Here’s a great example of that concept at work. 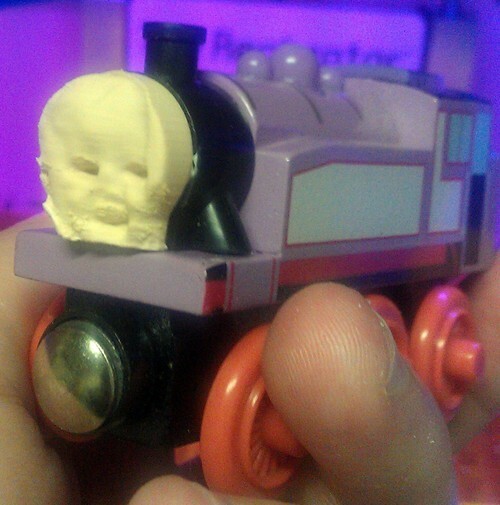 I took a model of my daughter Violet’s face, printed it, and attached it to a Wooden Thomas the Train toy. If you’re interested in having one of these made out of a picture of your child, send me a message. If you’re interested in more about how I made this, you can check out this page.